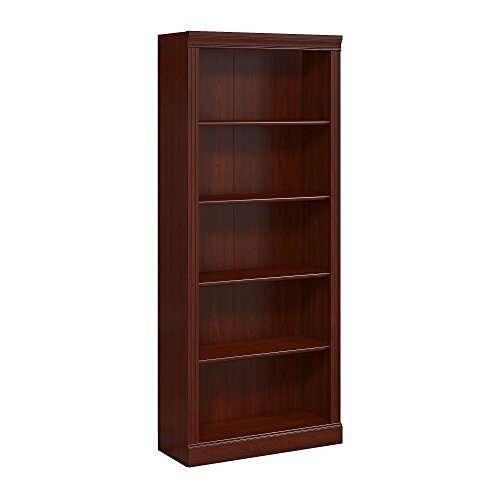 Whether you're looking to organize your clutter or display your novels and collectibles, this 5-shelf bookcase from the Sauder Select collection is perfect for you. It features three adjustable shelves so you can store and display all your favorite things at the heights that work best for you. 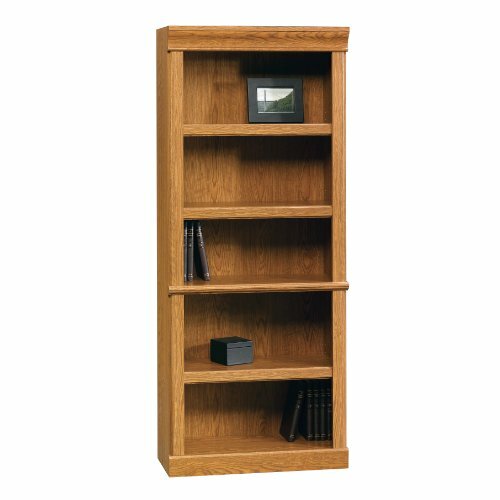 Finished in Abbey Oak, this stylish bookshelf is a great addition to any room in your home. Add a touch of elegant beauty to your home while creating versatile storage and display options with this library from the Sauder Select collection. It features five sturdy 1" thick shelves that are ideal for storage and display of anything your little heart desires – your collection of thousand page novels, decorative plants, bins full of supplies and all your awards and achievements too. It has room for all your stuff! 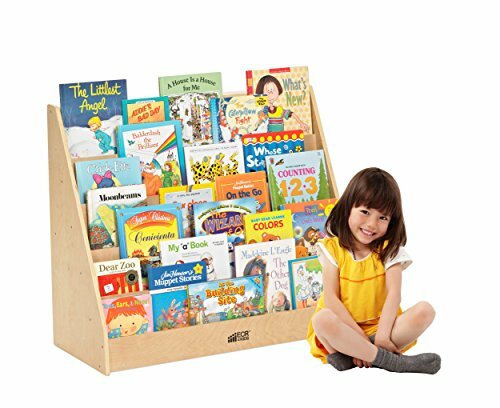 It has three adjustable shelves that offer you the ability to move them to different heights to create flexible storage options for items of all shapes and sizes. 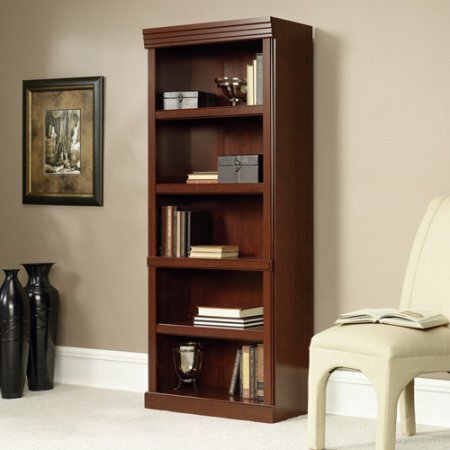 With its sleek design and classic charm, this bookcase complements in any room of your home – in the living room, down the hallway, in your office or the dining room. It looks good no matter where it stands! Finished in Estate Black, this attractive library gives your home the style you want with the functionality that you need. 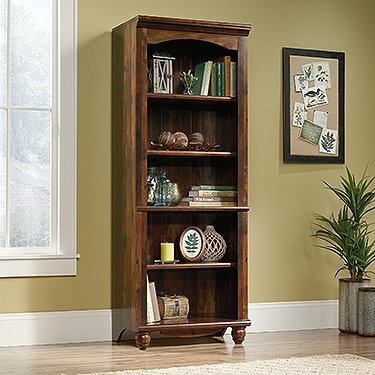 Bring a breath of fresh air into your office or living room with this library from the Harbor View collection. With three adjustable shelves, it provides ample amount of storage for all your reading materials or anything you wish to put on display. Finished in a Curado Cherry and detailed with solid wood, turned feet, this is the perfect piece to spruce up any home or office. 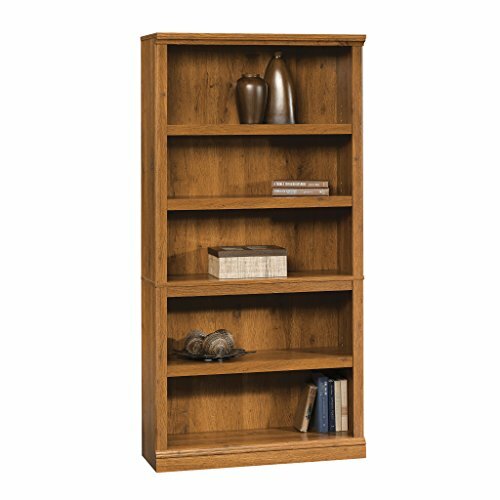 Classic furniture built to last, choose the Kathy Ireland Office by Bush business furniture bennington 5 shelf bookcase. This timeless slender design fits where you need it most or add multiples side by side for a complete storage wall design. Bookcase includes three adjustable shelves and two fixed shelves and features decorative edge detailing which adds to it's refined elegance and charm. Ideal for storing books, binders and decor, the rich Harvest cherry finish complements virtually any room or decor. Built to last and durably constructed, this product meets ANSI BIFMA furniture standards for safety and performance. Bring a sense of timeless style and tradition into your home or workspace with this and other products from the bennington collection. See the full line for other items available all backed by a 6 year Manufacturers warranty. Size: 29.803" L x 12.992" W x 71.26" Hx 12.992\"
This video was created to help train new student workers on how to straighten and maintain shelves. Want more 5 Shelf Library similar ideas? Try to explore these searches: Three Piece Barbecue Tool, Gm 14 Bolt Gears, and Rhododendron Hybrid.